These magnificent places of interest are combined into just one place. They can be visited at the same time, and place. Both of the Ijen Crater (Kawah Ijen) and the blue flame of fire are surrounded by Ijen Mountain. It is probably the best beyond Bali destination, yet easy to reach from Bali. Furthermore it is the closest place of interest which is located in Java island. The magnicient Ijen crater and the blue fire attraction are located in East Java, Banyuwangi district. It is close to Ketapang (about an hour drive), a ferry harbour which is connecting between Bali island and Java island. 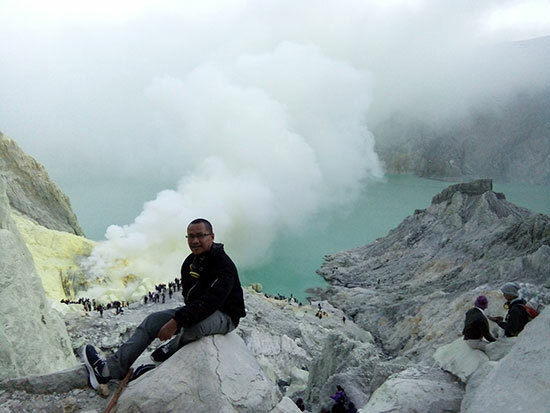 Ijen Crater is the number one tourism destination in Banyuwangi to attract not only the local tourist but also from overseas. When you decided to go there, and climbing the mountain, you will not be alone. There will be many climbers (hundreds, and sometime thousands in long week end, and any other national holiday in Indonesia) who is climbing all together. So there will be always companion to climb the Ijen mountain. From (for example) about 100 climbers, in average, about one fourth (25) of them are the overseas tourist there are about one fourth. From about 500 climbers there are about 100 climbers from overseas. Mostly the tourist come from European and Asian country. And most of them organized by their tour operator located either in Bali or Java (Banyuwangi or Probolinggo). The mountain itself has about 2,790 meters above sea level. For you information, any mountain which is lower than 3,000 is a moderat mountain. So, it should be easy to climb for everybody. But remember based on many climbers who had been climbing Ijen mountain, Ijen is so steep. Especially for the first step. Or, for the first 15 – 20 minutes of climbing, the pathway (which is only 1,5 meters wide) is quiet steep. The slant is about 45 degrees. After the first 15 – 20 minutes the pathway than becoming more easier and easier. For your information, if you are a solo traveler which is not organized by tour operator, the entrance ticket in Ijen is IDR Indonesian Rupiah 7,500. Very cheap! And the ticket counter will be opened at 12.00 morning time. They will open until the next two hours. So until 2AM. And sharp on that time, just for about 20 meters from there, there is a gate that will be opened by the officers and from there you will be start to climb Ijen mountain. 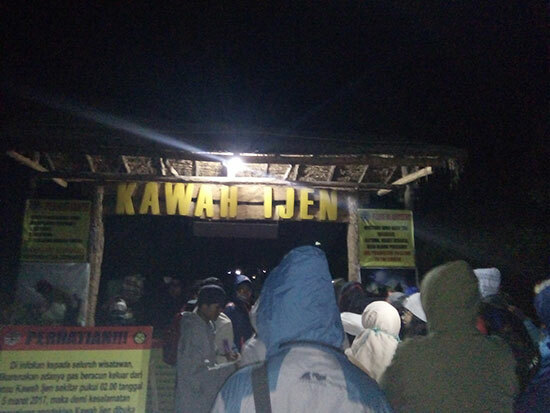 Ijen Gate: Start to climb! Where and When we can see the Blue Fire? Blue Fire, also knows as Blue Flame (which are only two existed in the world, another one is located in Iceland) located at the top of Ijen mountain. First, you want to see the blue fire. To do this you need to go down below. There is another pathway that will lead you to the crater. When you reached the bottom, you can see the blue fire which is very beautiful. On the way to the bottom of the crater, you will passed with several sulfur miner. When you meet them, just give a way to them. Do not ask them too much, as they are holding for about 30 kilogram sulfurs to be lifted up to the top. Some said Ijen sulfur miners is the most dangerous job in the world. 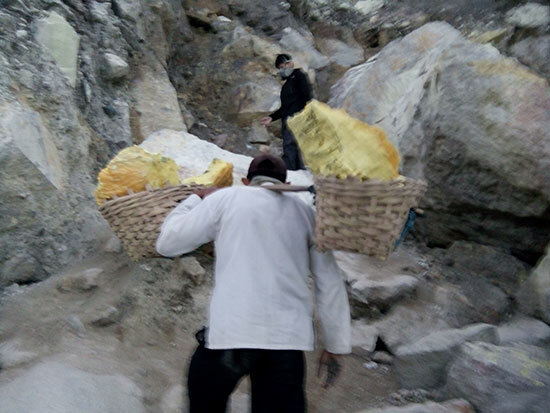 Sulfur miner in Ijen: The most dangerous job in the world! Please be noted the fire attraction will be disappeared, soon when the sunrise has come. So be sure you reached there before 5AM. Second, instead of see the blue fire at the bottom, you go the the top; this will lead you to see sunrise. Many people see that they have seen sunrise on various places around the world, but they admitted that the sunrise on Ijen Mountain is THE BEST ONE! So give it a try, climbing Ijen mountain in East Java, Indonesia!